(Minghui.org) Falun Gong practitioners in Sweden returned to the country’s largest annual health and wellness expo, the Harmoni Expo, held in Solna on October 29-30. Many visitors took an interest in this ancient Chinese cultivation practice, which is also known as Falun Dafa. Many people visited the Falun Gong booth to purchase books and exercise instruction DVDs. As the room for the Falun Gong presentation filled up on the first day, the organizer helped arrange a bigger room for the second day’s presentation. Many visitors registered to attend Falun Gong introductory workshop to be held in Stockholm, and while others got information on practice sites in other cities. Visitors also raised many questions regarding the persecution of such a peaceful practice in China. They were shocked to learn that the Chinese Communist regime has gone so far as harvesting organs from living Falun Gong practitioners for profit. They signed a petition calling for an end to the atrocity. A Swedish woman, Anette, and her boyfriend had attended several qigong classes before. She was excited about learning the practice after watching the Falun Gong presentation. She signed up for a Falun Gong introductory workshop. An Iranian young man came to the Falun Gong booth and asked a lot of questions about Falun Gong. He also brought his family to watch the on-stage exercise demonstration and enrolled in a Falun Gong workshop. He told a practitioner excitedly, “My name is Omid, which means ‘hope’ in Persian.” He stayed at the Falun Gong booth until the end of the expo. (Minghui.org) Stockholm City Hall is a famous landmark; the location of the Nobel Prize awards banquet held each year on the 10th of December. It is one of the capital’s most visited tourist attractions. Local Falun Gong practitioners frequently set up a display along the main road leading to City Hall for the benefit of the many visitors passing by. For the last several weeks, they have done so each and every day. Practitioners set up a display each day along the main road to Stockholm City Hall. (Minghui.org) Sweden’s largest health expo, the Harmoni-Expo, was held in Solna on April 2-3, 2016. Falun Gong practitioners were invited to the annual event, and introduced the practice to the public. More than 300 vendors took part in the exhibition in suburban Stockholm. Many people visited the Falun Gong booth, attended the introductory presentation, and watched the on-stage exercise demonstration. Exercise demo by Falun Gong practitioners at Harmoni-Expo in Solna, Sweden. Native Swede Carolina said she felt that the booth had strong and pure energy. With an interest in Chinese language and traditional Chinese culture, she had visited China several times. A practitioner introduces Falun Gong to people. Maria, a quiet young woman, listened to the presentation and came to the booth for more materials. She also signed a petition and wished the practitioners well. Most of the visitors also signed petitions to support practitioners. 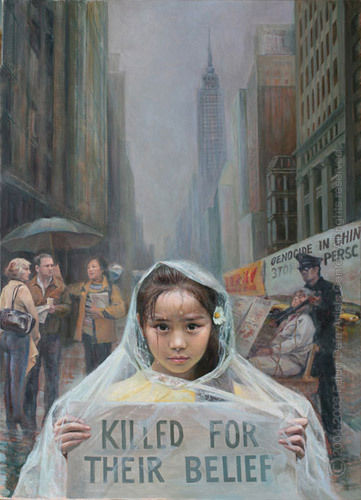 Falun Gong was introduced to the public in 1992, the number of practitioners reached about 100 million by 1999, when the Chinese Communist Party started a nationwide suppression. One event attendee learns about the persecution in China. (Minghui.org) Mr. Li Hongzhi, founder of Falun Dafa, traveled to Gothenburg, Sweden in 1995 and gave lectures on the Fa. Many people in Sweden have taken up the practice since then, and have benefited spiritually, physically and mentally. As the 2016 Chinese New Year approaches, Swedish practitioners have taken the opportunity to express their gratitude to Master Li. English translation: All Swedish Falun Dafa practitioners wish compassionate Master Happy New Year! My name is Annie and I began practicing Falun Dafa 21 years ago in 1995. Looking back on those years, I know that there were many things that I did not do well enough as a practitioner. Nonetheless, I am happy deep in my heart—because I am a Dafa practitioner, something we have been waiting for such a long time and through many life cycles. It is the best thing and the most important thing in my life. At the beginning of a new year, I have a hope to achieve more as a Dafa practitioner and do well with the tasks that need to be done. I know Master is waiting for us to make more progress and to mature, and to keep moving forward, to awaken more people to learn about Falun Dafa and the persecution. Compared to 1995, I have a much clearer understanding of what it means to be a Dafa practitioner and the importance of making good use of every opportunity to fulfill our prehistoric vows. To achieve that, I need to increase my time in studying the teachings of Falun Dafa, to upgrade my moral character, and eliminate my attachments. This will allow me to let go of human notions and move forward faster. Many times when I have eliminated human notions, I would be encouraged by a phone call or email that would often come afterwards. I also wish all practitioners a Happy New Year! By working together, we can become more diligent, and become more solid in our individual cultivation. This can present more opportunities to help other people understand Falun Dafa. I am also grateful for practitioners in China for their sharing articles. It helps us as one body to learn from each other and helps us keep up with the current situation of the persecution. My name is Thomas and I live in a town near Gothenburg, the second largest city in Sweden. Ever since 1998 when I was 14, the principles of Falun Dafa – Truthfulness-Compassion-Forbearance – have been guiding me, teaching me to be a better person and improving my health. I now feel that every day is productive and joyful. Thomas started practicing Falun Dafa when he was 14. The suppression of Falun Dafa in China has lasted almost 17 years. I want to do more to expose the atrocities of the Chinese Communist Party to the world and to the people in China. I also hope that the persecution can end soon and that Master Li can return to China and see practitioners in public. I also wish that Master could come to Gothenburg again. Master, Happy New Year! My name is Brett and I began to cultivate Falun Dafa in 1995. Before that I had been searching for my true home and the true meaning of life. That search ended when I found the answers in Falun Dafa, the best thing that ever happened in my life. Thank you, Master! I am Peter and I also became a Falun Dafa practitioner in 1995. I am grateful, as Falun Dafa helped me understand the important questions that we all have in life. I sincerely wish Master Li a Happy New Year! I am Pirjo from Northern Finland. My family moved to Sweden when I was 9. I was very fortunate to attend the lecture given my Master Li in Gothenburg in 1995. It was Easter, and I will never forget Master’s compassion and patience. Starting from that time, Falun Dafa has been guiding my life. My happiness comes from the bottom of my heart, because Falun Dafa taught me the purpose of life and awakened me. Through these years, Master also compassionately helped us overcome lots of difficulty on our cultivation journey, and I now understand the deeper meaning of what it means to be a Dafa practitioner. For the remaining time we have, I will work hard to let go of human notions, help more people understand Falun Dafa, and fulfill my prehistoric vows. My name is Ronald Franklin and I live in Gothenburg. I heard about Falun Dafa in the summer 2014, right after turning 80 years old. Since then I have been attending Falun Dafa exercises and Fa-study. Both my body and my mind have greatly improved. I am very thankful to Master for introducing Falun Dafa. It is a blessing for us, for society, and mankind in general. My gratitude is beyond what I can express in words. (Minghui.org) The Art of Zhen, Shan, Ren (Truth, Compassion, Tolerance) International Exhibition came to Sundsvall, Sweden from September 28 to October 10. The show drew broad interest from the news media and local residents. The major Sundsvall newspaper, Sundsvalls Tidning, reported the event on September 28 with an article titled “Forbidden Art Has Come to Sundsvall.” In addition to describing Falun Gong’s principles of Truthfulness-Compassion-Forbearance and its benefits on mind and body, the article talked about the severe suppression in China, especially the Chinese regime’s forced organ harvest from living Falun Gong practitioners. The article noted that the exhibition has been held in more than 300 cities in 50 countries and also highlighted the efforts of practitioners worldwide to oppose the persecution in China. Report in local newspaper, Sundsvalls Tidning, on the Zhen, Shan, Ren International Art Exhibition. The Sundsvall government supported this cultural event and provided a location in City Hall without charge. The chairwoman of the Cultural Committee attended the opening ceremony and recommended the exhibition to the public. Many people, including artists, came to the exhibition. Several teachers brought their entire class, to discuss both social studies and art. Taking in the artworks in Sundsvall, Sweden. Rolf attended a workshop when Mr. Li Hongzhi, founder of Falun Gong, visited Sweden in 1995. He had been to China before the persecution started in 1999. “When I stayed with Chinese practitioners, we each felt like we were part of a big family and there was no barrier between us,” Rolf recalled. (Minghui.org) Following a signature drive in front of Chinese Embassy on October 10, 2015, Falun Gong practitioners from across Sweden gathered in front of the Chinese Embassy in Stockholm again on October 24. They raised awareness and collected more signatures in support of the movement in which thousands are suing former Chinese dictator Jiang Zemin for initiating the persecution of Falun Gong. Many more people had an opportunity to learn about the benefits of Falun Gong and the 16-year brutal persecution of this ancient spiritual discipline in China. “It’s inconceivable…too evil,” said a middle-aged couple, after they hearda practitioner explain how the Chinese Communist Party defamed Falun Gong with fabricated stories, including the staged “self-immolation” on Tiananmen Square, and how the regime has gone so far as to harvest organs from living Falun Gong practitioners for profit. Many signed the petition when they learned that Jiang launched and directed the persecution of Falun Gong and that more than 190,000 Chinese people have recently filed criminal complaints against him. The couple and many others said they hoped Jiang Zemin would be brought to justice as soon as possible. (Minghui.org) The beauty of the Chinese meditation practice Falun Dafa was showcased for a fifth consecutive year at the annual Culture Night in Norrkoping, a town in eastern Sweden, on September 26, 2015. Many people visited the Falun Dafa open house, attracted by the diverse program which included: an origami lotus flower workshop, a demonstration of the Falun Gong exercises, and a petition drive for human rights. The culmination of the event was a screening of the documentary film “Transcending Fear” (2014), which tells the story of prominent Chinese human rights lawyer Gao Zhisheng. Gao, a Nobel Peace Prize nominee, has been in prison and under arrest for more than five years for defending supporters of Falun Dafa, Christians, and other victims of the Chinese communist regime. A couple and their daughter asked questions about Falun Dafa as they all made lotus flowers. They wanted to know why it is being persecuted in China and if it was a religion. The hosts, local practitioners, explained that Falun Dafa, also known as Falun Gong, became so popular in China that the regime feared it would become more influential than the communist party. The Chinese regime also has a tradition of banning any movement or group not in line with communist ideology, the Cultural Revolution being a prime example of state-sponsored destruction of traditional culture and values. The target this time was Falun Dafa. Visitors to the open house also learned that Falun Dafa is a method of cultivation rooted in traditional Chinese culture. It helps to improve a person’s character and health. It is free to learn, voluntary, non-religious, and non-political. Practitioners expose the persecution to help stop even more sinister deeds from being done behind the scenes in China. If nobody talks about these atrocities, the regime will get away with doing even worse things. Another young family who came to learn more about Falun Dafa signed a petition to stop practitioners from being killed for their organs, which has been happening on a large scale in Chinese prisons and army hospitals. A man and a woman curious about the Falun Dafa philosophy watched with interest a video presentation about it. The man took a copy of the book Nine Commentaries on the Communist Party, which details the Chinese Communist Party’s history of violent campaigns. He also took a copy of the report Bloody Harvest by David Kilgour and David Matas, two Canadian experts who investigated the claims of forced organ harvesting from Falun Dafa practitioners in China. Others expressed interest in learning the exercises. Several local newspapers published the program for Culture Night, which included the Falun Dafa open house event. Hundreds of program books were printed and distributed throughout town by the Norrkoping municipality, which sponsors the initiative. During the last 30 years, Culture Night in Norrkoping has gathered hundreds of artists, musicians, lifestyle enthusiasts, and art lovers from the town and the surrounding Ostergotland region.